[mini] recap of Beast of the East [take five]- congrats Rideau Valley Slaughter Daughters! A new champion emerges from Beast of the East this year in a clash between two leagues: Toronto Roller Derby and Rideau Valley Rollergirls. 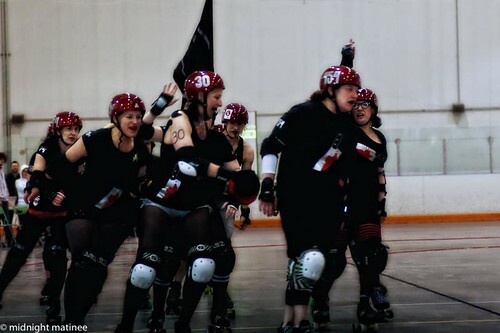 GAME 28 – CHAMPIONSHIPS – SLAUGHTER DAUGHTERS VS. GORE GORE ROLLERGIRLS – SUNDAY 5 P.M.
DDT back on the track. Bambi knocked on her back. Surgical Strike out of game. Four majors. 81 to 67 for Gore Gore now with 16 seconds left. Score adjusted to 83 to 67. Bambi penalty and sent to box. Soul Rekker 15 seconds left on jammer clock. Slaughter Daughters 87 85 ! A lead change back and forth victory that was pulled out of the jaws of defeat on the very last jam with the Slaughter Daughters down 83 to 67 for Gore Gore with 16 seconds left. Soul Rekker facing off against Bambi, then Bambi [starting off on the line with two minors to her name and number, then called for a false start minor] sent to the box on a minor backblock [and her fourth minor probably not seen by viewers on the Canuck Derby TV]. Which left Soul Rekker on the powerjam to score one grand slam, then another, and another. 83 to 81 Gores. But it wasn’t over yet. Then another grand slam by DDT. The crowd going crazy. FInal score 87 to 85. Undefeated Slaughter Daughters tame the Beast. 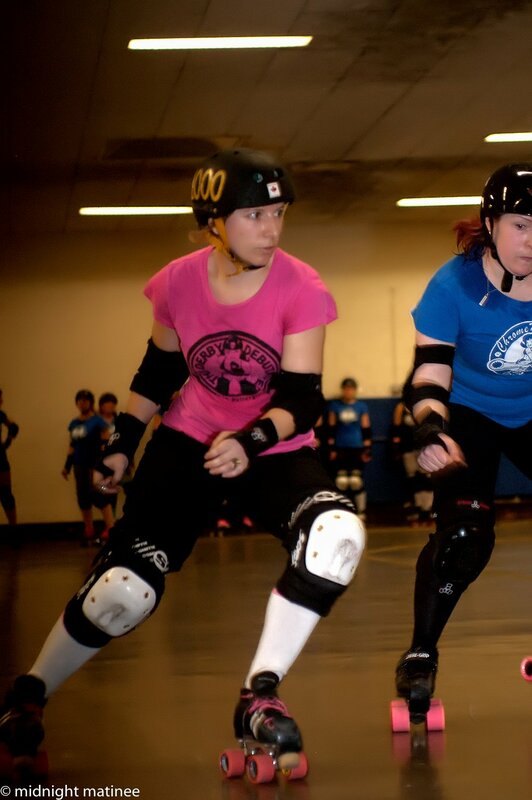 The teams of GTA Rollergirls ventured forth down to Montreal with high hopes and expectations. After all, the Debutantes had a taste of previous victories and redemption at Beast of the East, and for the Chrome Mollys it was their first chance to taste tournament competition. Also to be noted as well, the Debutantes had already had the pleasure of two tune-up matches to turn up the volume in their play in April against Rideau Valley Slaughters and La Racaille back to back over two consecutive weekends. GTAR had at least an inkling of what was to come. As intense as the competition and the atmosphere was to be at Beast within the confines of the arena, the Debutantes had to wake up at the crack of dawn to open the tournament and face their first match of the day. Les Duchesses from Roller Derby Quèbec were a somewhat unknown commodity but as a team were definitely a fun loving bunch. Pelvis Stojko their spokesperson had relayed that the bout with the Debutantes would be their first official match. 8:07 a.m. Saturday. Debs and Duchesses. Debs experience versus Duchesses in 1st bout. 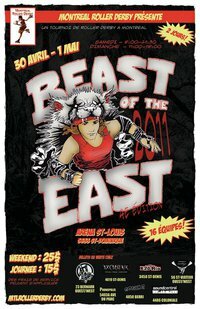 Canadian Psycho grabs lead jam against Duchesses de Québec at first bout at Beast of the East. Getcha Kicks on third jam. 9-2. Lee Way Wreck’Em. Power jam. 20 points. 29-2. Psycho. Debs Pack control. Grand slam. 48-2. Tara knocked out on next jam. Zero points. 48-2. GK against Pelvis. 4 points. 52-2. Psycho. Power jam. Psycho taken out. Duchesses cut track after block. Duchesses. Lead jam. Pelvis Psycho. calls it off after hit down. No points. 81-3. Getcha Kicks. Lead jam. 101-3. Debs hit century mark. Lee Way Wreck’Em. Lead jam. Psycho. practiced dead stop pack. Game over. 124-4. And on and on the night flew by and the mighty Debs fell to the “very young very tough and very fast” team of Montrèal in their elimination bout. Final score 62-29. Filles du Roi. Now to the story behind the story.